I should have known, before I even reached into my bag, which Rune I would pull out today. Tiwaz is relevant not only because it is Tuesday, but because it is the Rune of our Warriors and Today we celebrate those who sacrificed for our freedoms. Tiwaz is the rune of sacrifice of the individual for the well being of the whole. It is the rune of Balance and of Justice, of Sacrifice and Victory, of Order and of Peace. Tiwaz is a warrior rune named after the god Tyr who is the Northern god of law and justice, after whom Tuesday is named. Tyr is a one-handed god with a long history. He sacrificed his hand in order to trick the wolf, Fenris, into being chained. He was courageous, fearless, the master tactician and a consummate diplomat. In an Anglo-Saxon Rune Poem, Tyr is the North Star, around which the fixed stars in the night sky appear to rotate, Ancient seamen used this star as their main navigational aid in their long journeys and thus this rune aids us in travel as well. I personally use this rune as a moral compass. It reminds me to be fair and honest. To seek peace, courage and compassion. Like the North star, I need to remain true and calm and be the light that can lead others through the darkness. I need to be focused. 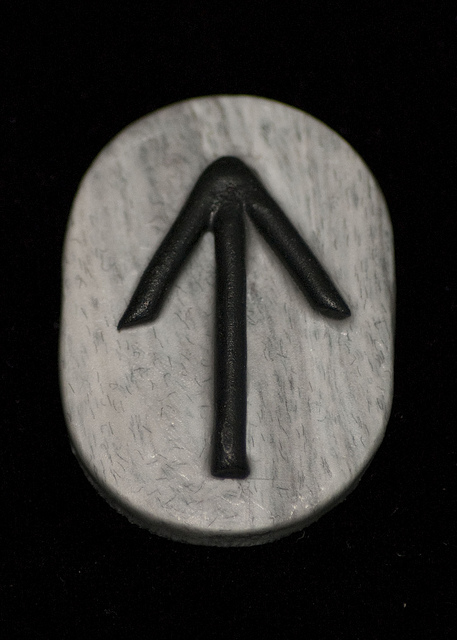 To channel my energy towards my target just as the arrow of this rune symbolizes. Tiwaz also reminds me that sometimes, to be victorious, I will need to sacrifice myself to the higher good.